Capsule rechargeableThere is 1 product. Rechargeable cap for your Dolce Gusto ® coffee maker. This solution allows you to save money but also to have the pleasure to choose and make the coffee you want. 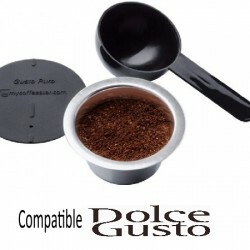 Gusto Puro is a rechargeable capsule compatible with Dolce Gusto ® coffee makers. Now you'll save money with this lifetime rechargeable capsule with the coffee of your choice. Gusto Puro is the innovative capsule of Mycoffeestar.